There is not room enough here to detail the causes of the Crimean war, but the Black Sea, dividing the Ottoman and Russian empires, was always a key location in the rivalry between these two powers. As a result their navies played an important part, and indeed the destruction of a Turkish flotilla by the Russian Black Sea Fleet in November 1853 at Sinope did much to precipitate France and Britain entering the war. The main war aim of the allies was the capture of the Black Sea Fleet's base at Sevastopol, and as part of the siege of that port the fleet was successfully bottled up there, with the result that many of the large warships were scuttled to block the harbour entrance and the sailors, who were an obvious ready-made supply of experienced artillery personnel, were used to man the defences on land. In fact these sailors formed the bulk of the city's artillery defences, with 8,886 of the 10,562 defending gunners being sailors. This set consists of a sprue of sailors previously released in the Russian Cossack Infantry and Sailors box plus a new sprue of naval gunners and two naval guns. The standard of sculpting is virtually identical between these two sprues, so our comments in the review of that set also apply here. 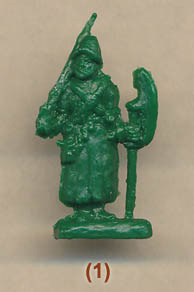 The reissued sprue contains sailors involved in infantry action and in works to bolster the physical defences, which were both roles that they performed during the siege. The new figures are directly concerned with firing the guns that were now pointing over the city walls rather than from the sides of ships. As artillery figures go these have some nice ideas. Apart from the inevitable men holding ramrods and matches there are others pulling on ropes, sighting the gun and even cooling the barrel. Pretty much all forms of dress are to be found on these men, from the full dress of the officer through those wearing their pea jackets and those in shirt-sleeve order to those stripped to the waist. Since the niceties of uniform were probably not a priority during the siege we felt these were all authentic. The guns are 36-pounders taken from the upper decks of the ships. This is the first gun Strelets have produced, and the result is a credit to them. While such ordnance is much simpler than field artillery this is nonetheless a nice little model. Each gun is basically the barrel, carriage and four wheels. We found the wheels needed a little filing of the holes to fit snugly over the axles, but in general everything fitted well and the resulting model is very nice, even including some of the rings through which the ropes passed when on board ship. The barrel should really be slightly tapered, and the reinforcement round the muzzle is somewhat exaggerated here, but the general design is sound. Given the relatively low quantity of pieces in this set we would have liked to have seen 68-pounders also included, which were much the same design but considerably larger. This is a respectable sculpting job but with some problem areas where detail is not all it might be. The figures are properly proportioned and in general well animated, and there is no flash worthy of the name. This kind of unit might not jump readily to mind when this important conflict is considered, but as we have shown their impact was considerable and they are indispensable in any of the various actions around Sevastopol. Rather light on figures compared with Strelets' normal standards, and perhaps two sprues of the artillery figures could have been included to bulk the set out, but what there is is a very fair effort.